This collection is a must have for your library! Bullinger covers a wide range of topics from twelve practical priciples of Bible study to a complete eschatalogical commentary on the Book of Revelation. Look below to see complete list and description of all 11 titles in this set! Add these eleven Bullinger titles to your library today! This set is filled with challenging questions and answers on controversial issues such as biblical prophecy, end times, and numbers in scriptures. Follow along as Bullinger guides students on an expedition of his twelve practical principles of Bible study and interpretation in How to Enjoy the Bible! Also included is Bullinger's Companion Bible Notes! These are excellent textual study notes and detailed outlines on numerous thematic studies. The work also includes 198 different appendices of Hebrew and Greek words and their use, additional studies on biblical usage of figures of speech, study charts, lists of proper names, calendars, timelines, and much more. A popular book by E.W. Bullinger with a very unique theme. Taking up an interest in the historical and cultural background to the origins of the zodiac relationship to biblical concepts, Bullinger did a lot of work looking at the idea from a Biblical point of view. One very interesting technique was the comparison of the original constellation and star meanings with texts in the Old and New Testaments. He explores the star names in various ancient languages as well as corresponding scripture. A highlight of the book is his carefully researched word studies tracing roots from Hebrew, Greek, Arabic, and other languages. Celestial charts and diagrams are also provided to lend support to his conclusions. 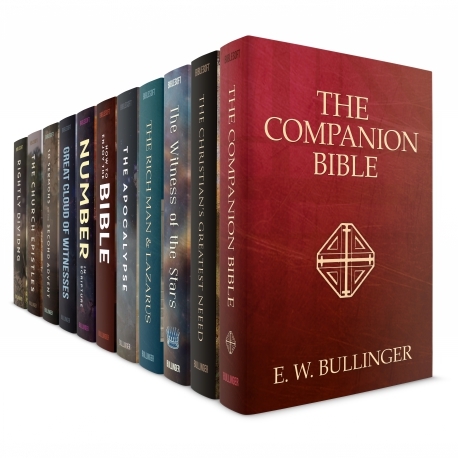 I have Bullinger's The Companion Bible, The Witness of The Stars, Great books! !